Winter is here and is sure to bring Albany residents our fair share of ice and snow, and traffic accidents. Following a few basic winter driving safety tips can reduce your chances of a mishap. While it's best to stay off the roads during major snow storms, there are times when you just can't stay home. Protect yourself and your loved ones from injury, and be sure to drive safely! Listed below are 10 basic tips for driving safely in winter weather conditions. To monitor road conditions in and around Albany, check out our live Albany traffic cams! Don't be one of those winter drivers who heads down the road peering through a tiny hole in their frosty windshield. Take the time to scrape your entire windshield, side windows, and back window of your vehicle, or give your car time to warm up and fully defrost. Snow, ice, and frost can block your plane of view, increasing blind spots and greatly increasing your chance of an accident. Yes, this includes the roof of your vehicle! Drivers who do not fully clean their cars present a hazard to others on the road. As you drive, any snow or ice that remains on your car will leave a wintry trail behind you. Solid snow and ice chunks tumbling off your car could potentially cause damage to vehicles following you. Your headlights not only help you to see in poor weather conditions, but they also help you to be seen by other drivers on dreary winter days. Be sure to scrape the snow, dirt, and frost from your headlights when you're cleaning the rest of your car. If your worry is being late, leave early. Don't drive too fast for the conditions. 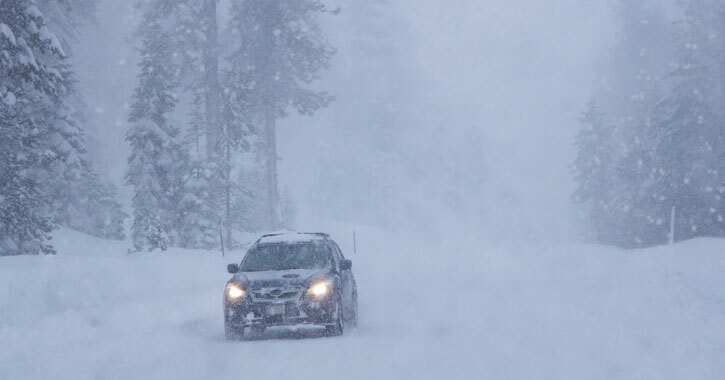 Experts recommend driving at least five miles below the speed limit when the weather is bad. People who drive at a reduced speed are much less likely to be involved in a serious car accident. Depending on the length of your trip, faster speeds may only save you a minute or two, but in winter weather conditions, they could end up costing you your life. The last thing you want to do in slippery conditions is slam on your brakes. If you are following at a safe distance and driving at a reduced speed, you should be able to come to a stop by slowing down well in advance and slowly applying the brakes. Keep a safe distance between you and the car in front of you. Even when the weather conditions are ideal, experts recommend being at least two car lengths between vehicles. When driving in snowy and icy conditions, it is best to increase that to at least three. This tip applies to driving year-round! A tractor trailer is almost all blind spots, so don't follow too closely. If you can’t see their side mirrors, the driver can't see you. If you must pass them, do not linger at their side where they will not see you and may attempt to change lanes with you there. Even on multi-lane highways, always pass tractor trailors on their left, as the blind spot on their right-hand side is significant. Also, do not cut off a tractor trailer. Even in the best of driving conditions, these giant trucks cannot stop like a car (which makes perfect sense if you consider the number of tons behind them), so do not risk potential injury from a large truck hitting you by driving irresponsibly. Since air is colder than the ground, bridges tend to be icier than roads and often develop black ice, even when the roads themselves are just wet. Reduce your speed when going over bridges, and be mindful of "invisible" black ice. Even if you're a very responsible and safe winter driver, there is no way to predict other drivers' behavior or what may happen on the roadways. It is a good idea to keep warm winter clothing, a blanket, and a flashlight in your car during the winter, just in case. Always make sure you have your cell phone fully charged. In the event that you do go off the road or break down, turn your flashers on, stay in your car, and wait for help to arrive. When visibility is poor and you are driving slower than the speed limit, especially on thoroughfares such as I-87, I-90, and 787, stay in the right lane (if possible) and turn on your hazard lights. Even if there is a long line of cars ahead of you, we've all been in situations where you are suddenly in a squall. Turning your flashers on lets the cars who are traveling farther back on the road see blinking lights ahead and helps them start to slow down in advance, potentially avoiding a multi-car pile up. The only thing that makes you safer than practicing safe driving habits is when others also practice safe driving habits! Help make the roadways a safer place this winter by sharing these winter driving safety tips on your social media pages. It's a great way to show your friends that you care about their safety - and your own!